I’m easy… – …STILL CRAZY AFTER ALL THESE YEARS! – I wouldn’t have bought it otherwise – even though there are others that have been given a 5 like our own made-in-Sibu instant kampua, the dark soy sauce version. Personally, I prefer the original – the one with the light soy sauce but that one was also given a 4 out of 5 only. I guess that goes to show that one man’s meat is another man’s poison and one may prefer something to another according to one’s own taste and liking. I know for one that my friend, Annie, in KL loves the dark soy sauce version but my friend from New Zealand (who initially could not believe that anything that pale and plain-looking could ever taste nice) thought otherwise. To each his own, that’s what I always say, to each his own! These days, many have taken to giving two or three of this and that but I do think that at the end of the day, it is the overall taste that matters. …before placing it in a bowl even though I did read a more recent report that there wouldn’t be any harm just boiling it and adding the seasoning and eating without going through all that. …and sat down to enjoy the fruit of my labour. It was not salty like some of the others. Normally, I would just boil a little bit of water and use only half of the seasoning but for this one, I used all of it and it was all right. In fact, I thought it was a little on the sweet side, not quite like curry and if it had been thick, I would think it would be a little similar to the gravy in mee jawa. 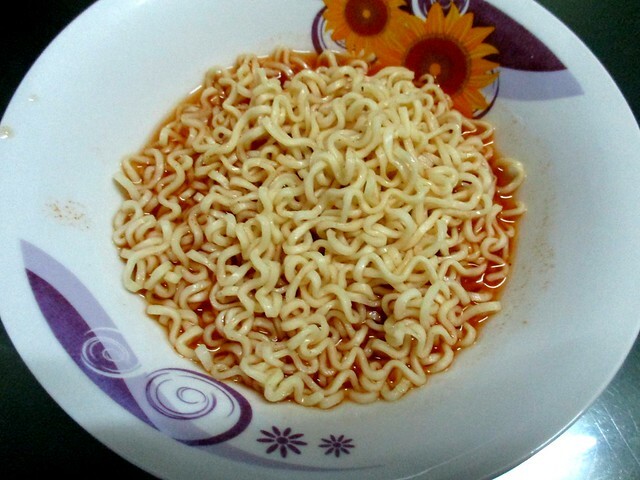 It certainly was spicy though – I had that lingering sensation in the mouth for quite a while after I had downed everything in the bowl. 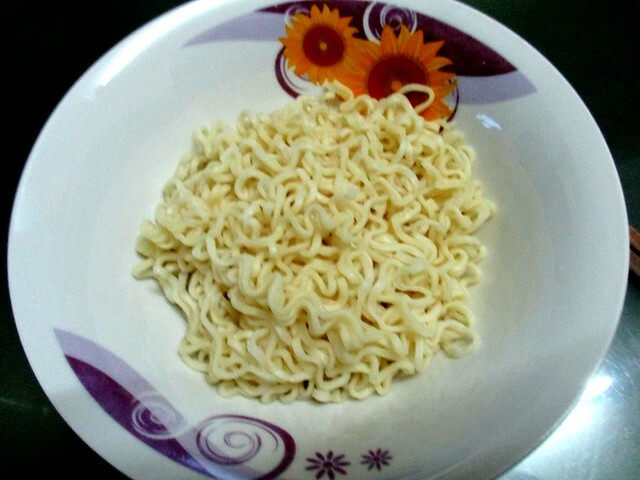 I am very hungry now looking at your ramen. MMmmmmm……. 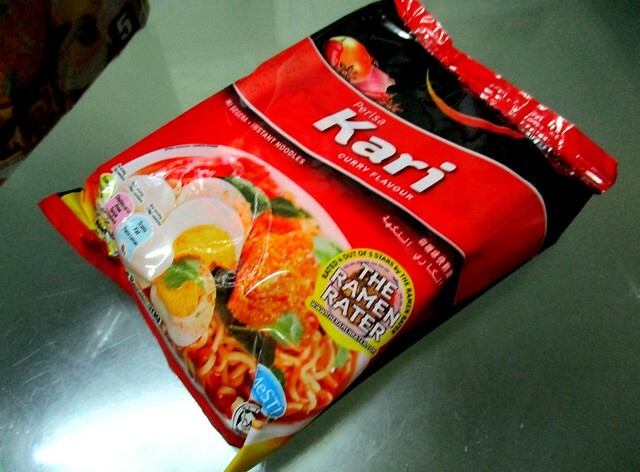 Did you read any of the spicy spicy Korean instant mee challenge that is all over the social media? it is supposed to be super duper spicy. You are? Nothing fancy there, keeping it simple to get the original taste. Yes, I saw that. For one thing, I am not all that into anything Korean, most would taste like kim chi to me, no, thank you! You haven’t? He’s pretty well-known. Me? I probably would give it a 3 out of 5, nice but by virtue of the fact that it did not really taste like curry. Wow look at that! I’m pretty happy they wanted to put my logo on their package but really really happy to know you bought it because of that – that’s a real compliment! Thank you! Glad you liked it! CarJEN also makes a Nyonya Curry Laksa which is really awesome too. Nice plate you have there, free gift? Spicy?…not for me then. Anything with extra ingredients added definitely brings the taste to a whole new level. It’s raining cats & dogs outside now and your bowl of ramen makes me drooling. You’re not? I thought Kuching people like it hot not like the ones here in Sibu…but we’re learning – we do have spicy stuff here and there too these days. That’s right, the bowl’s a free gift. Most of what we use in the house are free gifts. Yes, I saw all the photos on Facebook – raining so heavily, flooding everywhere. Best to stay home, make do with what’s in the pantry or the fridge. 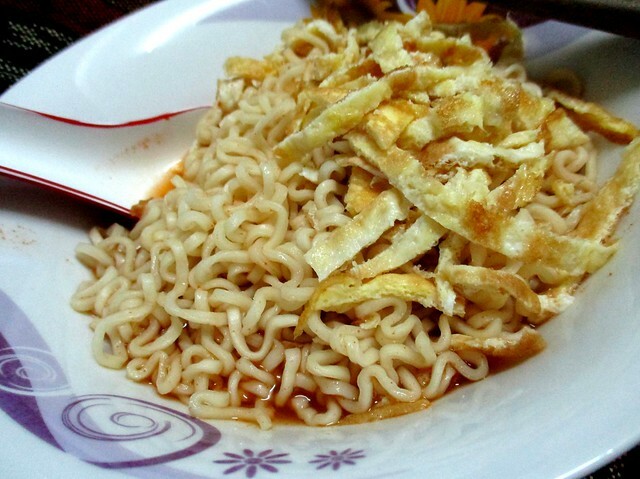 I’ll love to give this a try and WOW Ramen Rater himself commented on your blog! 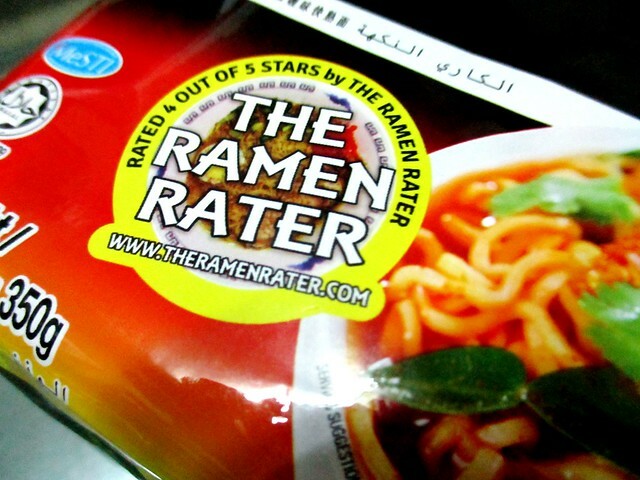 Wow – nice visit from the Ramen Rater. I used to read his blog, especially his visit to Malaysia, but have not done so of late. Oh? Can’t remember if I’ve seen that but I do drop by sometimes to browse through her reviews. Didn’t look at the other flavours available, not too sure what they else have. Curry for me, not into chicken unless it is our made-in-Sibu Mee Daddy – theirs is a head above the rest! 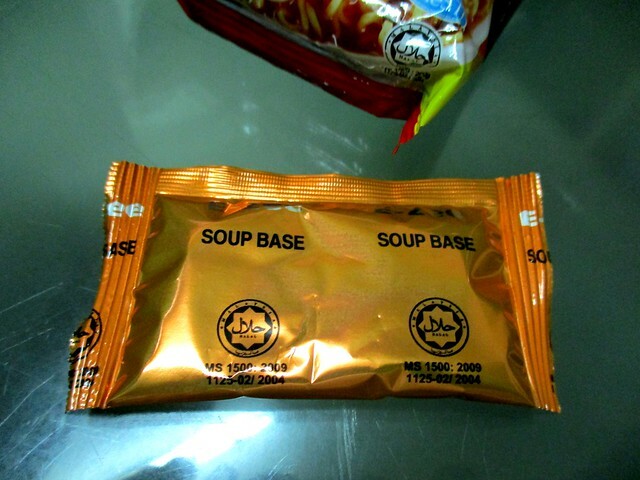 There are so many brands of these instant noodles. I do like to browse at the supermarket but I have not bought any. More and more and more. Never seen this brand before – I only bought to try because of the endorsement. That is the first I’ve heard of the ramenrater! Oh? I can’t remember how I came across his blog…but I did. Pingback: Any other way… – …STILL CRAZY AFTER ALL THESE YEARS!